Project obstacles and solutions: The LaPorte District of the Indiana Department of Transportation (INDOT) repaved 17 separate projects in northwestern and north central Indiana with chip and seal roadways. IMI Aggregates supplied 43,460 tons of SC-12 dolomite limestone for these projects. 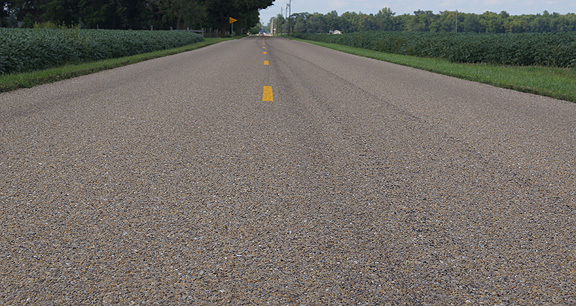 SC-12 is a low-dust stone that is specific to INDOT. It is used for repairing roads in chip and seal applications. The IMI Aggregates quarry at Huntington supplied the INDOT approved stone. IMI used nine independent trucking companies to supply the 17 job sites. These projects extended out as far as 127 miles from the quarry. In any road project, timing and efficiency is of utmost importance. So is safety. IMI worked closely with five INDOT managers to schedule delivery around low traffic times. The key was to keep the supply of stone readily available so there was no down time, but also to work safely. IMI extended normal hours to accommodate INDOT work schedules. Trucks were loaded and dispatched as soon as they returned to the quarry. IMI personnel were on hand prior to delivery of the stone to inspect drop areas to ensure that there was enough space and equipment had plenty of room to move in and out of the site safely. In all, nearly 300,000 miles were logged delivering SC-12 stone to the job sites. All 17 of the INDOT projects were completed in 29 working days.